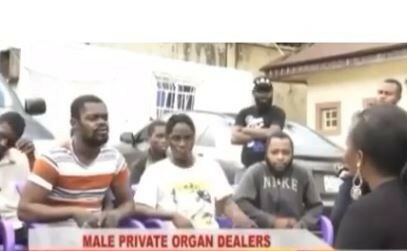 The Kogi State Police command just confirmed the arrest of a 10-man gang that specializes in selling penises. In a chat with AIT, they revealed how they killed four local vigilante men and a Police Officer in Ofu LGA during one of their operations. 39-year.old Yakubu Ahmedu is the king pin of the gang. He had held positions of Secretary of the Local Vigilante Group for five years and was its chairman for one year in Ankpa LGA where he hails from. In these capacities, Yakubu said he had access to arms and munitions with which he hunted down victims for human parts, especially male private organs. But the business nosedived after the arms mop up directed by The Inspector-General of Police. Consequently, Yakubu Ahmedu resorted to recruiting youths in the community to resuscitate the business. However, when he failed to keep his promise to give the young lads a comfortable life, one of the gang members, 18-year old Obila Attah. decided to turn the group in to the Inspector-General of Police Special Tactical Squad. Abomination!!! People are more than wicked but what do they use it for? Why not use their own?